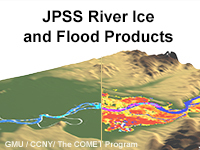 This lesson introduces hydrologists, meteorologists, and the education community to two new JPSS (Joint Polar Satellite System) satellite capabilities for monitoring river ice and flooding. It begins by describing the need for information on river ice and flooding, the capabilities of the Suomi NPP and future JPSS VIIRS imagers to provide products for monitoring river conditions, and the new river ice and flood products. This is followed by several cases, notably the May 2013 Galena, AK flood event, that demonstrate the use and value of the products in monitoring river ice and related flooding. The cases also show additional applications in flooding and ice cover scenarios that are not related to ice jam events. Finally, they highlight the products’ role in supplementing other types of observations commonly relied on for monitoring river conditions. It could be less cumbersome to take this course. A good introduction to these products. I thought this was course was worth taking. It could use some more cases to illustrates the points needed to be made. Looking forward to giving it a try when it becomes available in AWIPSII.